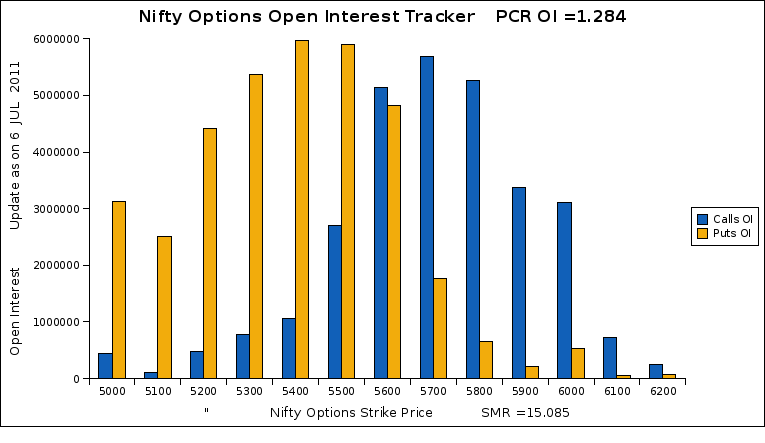 Higher Open Interest built shifted from 5300PE to 5400PE which shows the optimistic view of call writers as they are inching forwards and had upgraded their support levels to 5400 zone. Also 5500PE has considerable amount of open interest and almost equal to 5400 Open interest. Probability of 5500 acting as support for this current uptrend is also little higher for current option season. NIFTY BULLISH ONLY ABOVE 5750 CLOSING BASIS.BUT NIFTY TURNED AT 5740.SO NIFTY IS BEAR TREND STARTED.NIFTY RETEST THE JUNE 2011 LOWS THAT IS 5190. I want to learn calculation of Money Flow….. If u have any formula for counting Money flow of different strike of Options..